1877 wasn’t the only year to have a significant pit accident in Blantyre. On Saturday 30th August 1930, a huge explosion occurred at Number 1 pit, Auchinrath colliery belonging to Messrs Merry and Cunningham. Fourteen men were entombed in frightening circumstances and after great difficulty, only 10 of them could be rescued. It was officially stated that five men were dead with one taken to Hospital in a critical condition and when he died, the total went up to 6. Gordon Dunsmuir was kind enough to inform me that a cousin of his family was involved in this accident and provided a newspaper photo. For you Gordon, i’ve investigated the story, putting some more detail on the incident, as below. Andrew Kalinsky of 20 Merry’s Rows, Blantyre. Richard Dunsmuir of 9 Small Crescent, one of the injured men, was in a critical condition and was taken to the Glasgow Royal Infirmary hospital with extensive burns. Sadly, he died of his injuries the next day (31st August), whilst still in hospital.When the rescue party arrived at the miners, they found to their horrors, amongst the group of huddled men, five of them were laying face down, with blankets over their bodies. Three of the men were practically unrecognisable from the fire injuries. Weeping woman gathered at the pit head, some having to identify the bodies of their men. Other men were injured. John Smith of Merrys Rows, William Stoddart of Auchinraith Road, John Wildman of Hamilton, James Russell of Burnbank, Robert Buchanan of 58 Craig Street, Alex Paterson 21 Merry’s Rows and John Copeland of c/o McKerrel, Redmore Place. According to reports, although not heard in Blantyre, the explosion at the Black Band Seam was a serious one and the men engaged in the incident had little chance of escape. The blast had happened some 750 yards from the main shaft in “Dunsmuir’s Section” and the “Long Wall” in the Blackband seam. It was reported one of the men (Mr Kalinsky) had returned to work only that day after a long spell of unemployment, and his wife had risen from her sick bed when she heard of the news. Another newspaper reported that Mr Copeland, one of the survivors said he was walking up the road to the hutch and was about to put on his chains when he was thrown through space and knocked unconscious. On recovering his senses, he found he was laying on the track. He crawled away as best as he could knowing that if he followed the railway, it would lead him out. A member of the rescue party said that the pit in which the explosion happened suffered very little damage and the dead men were killed by fire and the force of the explosion. It is likely the dead men died quite instantaneously. When news of the pit disaster happened, off duty colliers from other pits , rushed to the scene to volunteer their rescue services, but were advised to return home as only trained specialist equipment and rescuers would be permitted to enter the area. Blantyre was in deep mourning all through September 1930 with work suspended. The churches being very sympathetic in their sermons for many Sundays thereafter. An inquiry did take place, commencing in Hamilton on 11th of November 1930, where 41 witnesses were called to give evidence. The colliery manager by then was Mr David Gemmell. Considerable gas problems had been encountered earlier in the May of that year and even firemen reported gas being present in the Dunsmuirs Section, just 10 days earlier, although no further gas reports were logged in the book after 20th August. Fireman Thomas Heggison stated that he found firedamp (gas) in No 1 and No2 branch road off “Jack’s Slope” on the day of the explosion, but did not report it. It was also claimed by some miners that a Mr William Sproat did not test for firedamp before he fired the shot that triggered the explosion. The inquiry found that all 5 firemen and all miners had neglected their duties that morning. In particular, three firemen had negelected to test for firedamp over a radius of 20 yards from the work place. Regulations stated that incombustible stone dust should have been spread within the area where coal was being extracted but miner Robert Clelland claimed in evidence that no dust was available before firing the shot that morning. The Inquiry also determined that the colliery manager neglected his duty by failing to ensure that the Provisions of the Explosives in Coal Mines Order were enforced in Auchinraith Colliery. 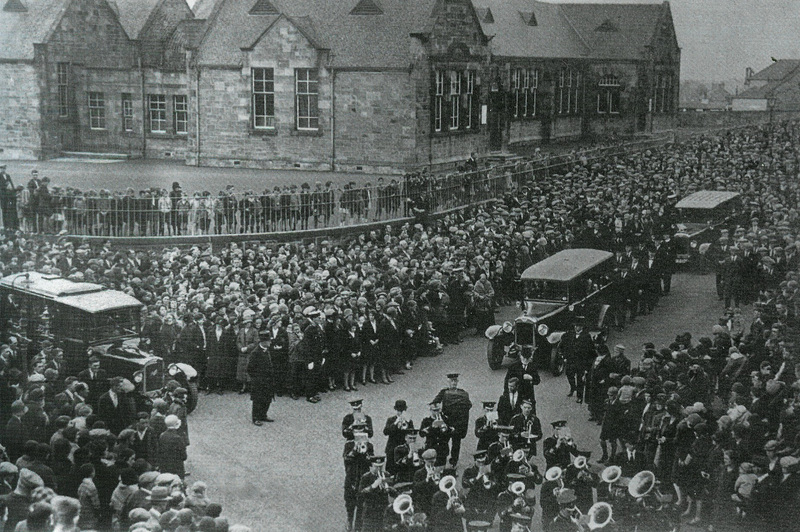 Pictured here is the funeral procession at Auchinraith Road and you can see from the crowds what a deep sorrow Blantyre felt for this event. 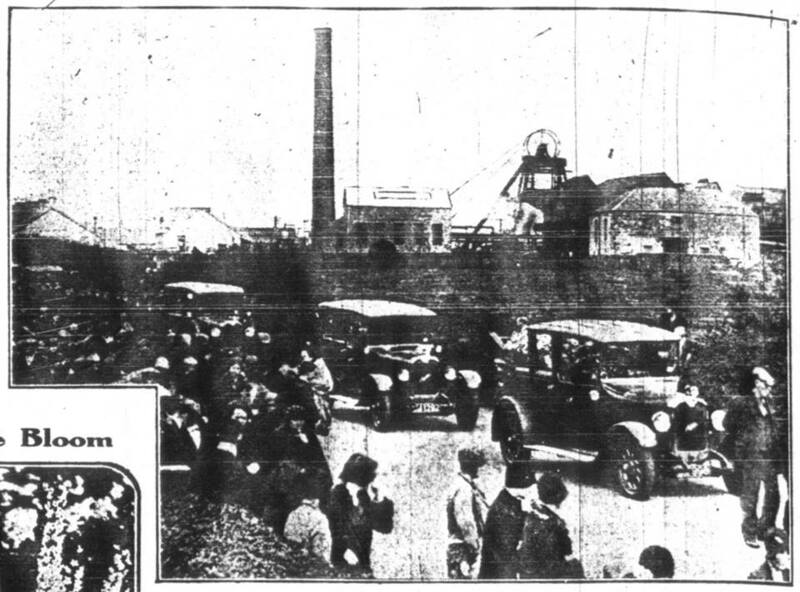 Around a year later on 16th August 1931, over 350 jobs went overnight when the pit closed very abruptly, the miners told to finish their shift and go home.